The reading room at UBC's original Fairview library (UBC Archives). In 1914 James Thayer Gerould was hired for a book‑purchasing mission in Europe on behalf of UBC’s Library, but his trip would not go according to plan. 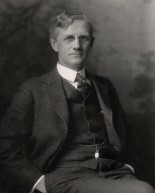 James Thayer Gerould (photo courtesy of University of Minnesota Archives, University of Minnesota – Twin Cities). Dr. Frank Wesbrook was faced with many competing priorities on being hired as UBC’s first president, but one of the most pressing was the establishment of an adequate central library. For advice, he turned to a former colleague from the University of Minnesota, the institution from which he had recently been recruited. James Thayer Gerould was librarian there. He agreed to help stock UBC’s Library in time for the university’s opening in 1915. The plan involved travelling to Europe, where Gerould believed he would be able to secure a better price – as much as 20‑30 per cent less – by going directly to dealers and bargaining on the spot. A plan for how the funds would be divided between subjects. Math was inadvertently left out. Since Wesbrook had yet to hire a librarian, Gerould also offered to oversee classification and cataloguing. He asked for a salary of $250 per month plus travelling expenses and requested a swift decision, because he thought it best to leave as soon as possible. By the following month, an agreement was in place. The librarian set sail from Boston on May 5 on the S. S. Cymric of the White Star Line. “I am eager to get at the job and to make good on your gamble,” he wrote to Wesbrook the day before. Later that month another letter arrived in Vancouver, written on notepaper from the Imperial Hotel in London’s Russell Square. Gerould reported that he had secured the services of export booksellers Messrs. Edw. G. Allen and Son, Ltd. Allen was one of only two sellers Gerould trusted to do the job, which was to include binding or rebinding books before they were shipped, via Blue Funnel Line, on a 72‑day journey across the Pacific. Gerould and Wesbrook had initially discussed shipping the books in in tin‑lined cases, but instead – because it weighed less and was cheaper – Gerould recommended using heavy waterproof paper. 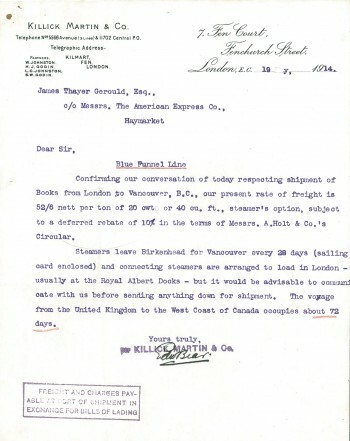 UBC’s books were shipped from Europe on the Blue Funnel Line. Gerould and Wesbrook kept in touch via letters and cables. 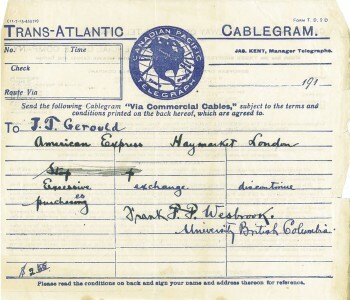 This cable instructed Gerould to stop purchasing because of an excessive exchange rate. For the next few weeks, Gerould went about his business. 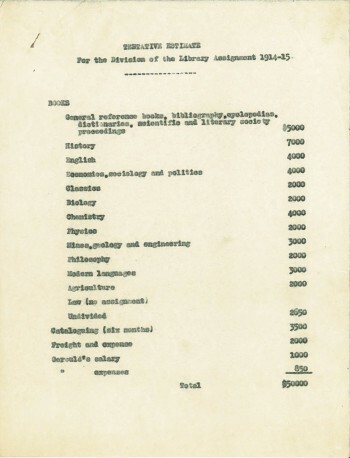 A letter from Wesbrook dated June 16 indicates that they had inadvertently overlooked a subject: “It is strange that we missed mathematics,” he wrote, instructing Gerould to cut $1,500 proportionately from other subject areas and put it towards math books. Another time, a cable arrived asking Gerould to discontinue purchasing because of excessive exchange rates. In July, after making large purchases in Oxford and Cambridge, Gerould made his way to Paris. After that, the plan was to go to Leipzig in Germany. He found most books unbound and stock to be poorly classified. It also rained a lot and he worked long hours. “I shall be glad to get out of it myself for the twelve and fourteen hours work which I am doing here is beginning to tell on me,” he confided. Although Gerould was eager to leave Paris, he would find things far more disagreeable in Leipzig. The assassination of Archduke Franz Ferdinand had occurred a few days earlier, and war in Europe was imminent. In a letter to Wesbrook dated July 31, three days before Germany declared war on France, Gerould documented the situation in Paris. He observed that the streets were crowded yet orderly, with a strong police presence. But chaos would not be held in check for long. A trial involving a Madame Caillaux was underway in France at the time. She was the wife of politician Joseph Caillaux and had shot dead the editor of Le Figaro newspaper, which had been publishing letters her husband was writing to another woman as part of a media campaign against him by political enemies. It was judged a crime of passion and she was acquitted. When the verdict was announced, the Paris streets erupted. The letter was likely delayed by wartime conditions, and Wesbrook would not receive it for a few weeks. Days went by with no word from Gerould. “We are wondering what in the world you are doing in these times of war and desolation and shall be expecting to hear from you by cable or otherwise if it seems unwise to go on with your work,” the university president wrote to him on August 3. “If Europe is embroiled in war, it may be better to stop purchasing and shipping at this time…” And on the bottom of the typed letter, scribbled in pencil: How will you be getting back again? 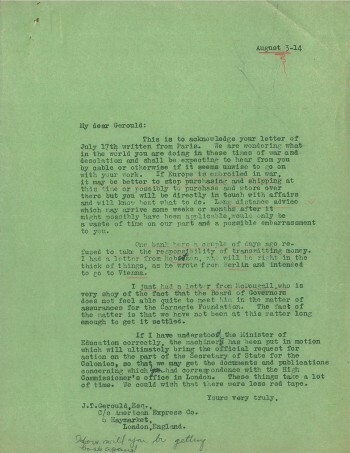 Wesbrook wrote to Gerould on August 3, the day Germany declared war on France. Then a letter arrived that could only have added to the president’s unease. It was from Miss S. L. Stewart, Gerould’s secretary. Meanwhile, as concern mounted among his friends and colleagues back home, Gerould had fallen into a predicament that caused his regular stream of letters and cables to be abruptly cut off. Although he wrote to Wesbrook as soon as he was able, on September 2, with a detailed account of what had happened to him, the president would not receive that letter, nor any other news about the librarian’s whereabouts and well‑being, until much later that month. Gerould had arrived in Leipzig in the small hours of August 3. Later that morning he telephoned his correspondent, who now advised him to leave Germany as quickly as possible. Gerould boarded the last scheduled train for Basel, Switzerland, but the train was stopped at Mannheim and passengers were instructed to take a ferry across the river to catch another train at Ludwigshafen. The crowds were so great that Gerould failed to catch the train and had to find lodging for the night. The next day he stayed in his room. On August 5, he continued on his journey towards Basel. He was delayed by police for four hours at Landau, then allowed to carry on. But not for long. Gerould had little cash. He was aided by the American Consul in Mannheim and friends in Leipzig, eventually making his way to Vevey, Switzerland. With the embassy advising against Americans coming to Paris, he would need to find another route home. Gerould wrote to Wesbrook on September 2 explaining what had happened to him. “I am in rather poor shape physically,” he told Wesbrook in his September 2 letter, “but it looks now as if I should have time enough to recuperate but I assure you that even Switzerland is far from being a good place to be at the moment.” The rest of Gerould’s letter dealt with the comparatively mundane business of book‑buying and the outstanding transactions from Paris. Today’s library: the Chapman Learning Commons in the Ike Barber Learning Centre. Photo courtesy UBC Library. By this time, Wesbrook had finally learned, via a third party, that Gerould was safe and on his way back to the States – but he had yet to receive the librarian’s letter containing the details of his encounter with the German authorities. * Please note that Gerould’s handwritten letters are difficult to decipher in parts. The place names described above are, in our best judgment, correct. 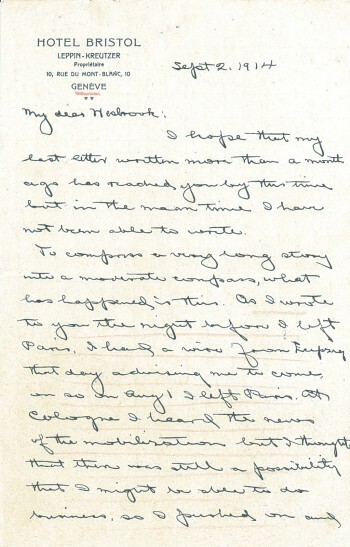 Thanks to UBC Archives for providing access to correspondence between Wesbrook and Gerould. UBC’s University Librarian, Ingrid Parent, has this year been conferred an Honorary Fellowship by the International Federation of Library Associations and Institutions (IFLA). Parent is the third Canadian to be given this distinction; 30 fellows have been honoured since 1936. The honour is the association’s highest award and conferred on the basis of merit. An active member of IFLA since 1995, Parent served as its first Canadian president from 2011 – 2013. 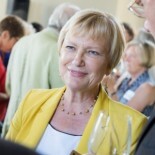 She has been noted for engagement in promoting Canadian libraries in the international library community. Her presidential theme, “Libraries a Force for Change”, highlighted the global digital potential of libraries to provide inclusive and transformative services, innovative ideas, and new ways to collaborate. Her other achievements with IFLA include the development and release of the IFLA Trend Report, which has been published in over a dozen languages. The Report encourages library communities to lead, shape, and drive the evolving digital information environment. In her role as University Librarian, Parent has used her international experience to bring the world to the UBC campus. In 2012, UBC Library hosted the Indigenous Knowledges conference and was instrumental in bringing the UNESCO Conference, The Memory of the World in the Digital Age – Digitization and Preservation, to downtown Vancouver. In 2013, the Library hosted the annual meeting of the Pacific Rim Digital Library Alliance, which drew scholars from both sides of the Pacific and, the University has benefited from a number of national and international partnerships including those with Peking University Library and the University of Washington’s Library. Parent is a UBC alumna, graduating with a BA Honours in History and Library Science degree, and has a honorary doctorate from the University of Ottawa. The award was presented to Parent in Cape Town, South Africa in August during IFLA’s World Library and Information Congress.